Madigan squeeze for a dummy foal. We just had a call from a colleague asking for a video on doing the Madigan squeeze for a dummy foal. 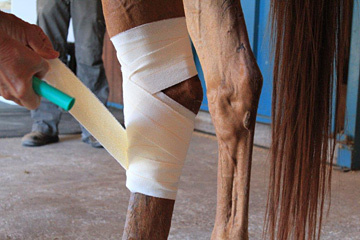 There are many ways to place the ropes on foals. This is how we do it. I use a soft cotton rope but this lunge line was perfect for this demo. 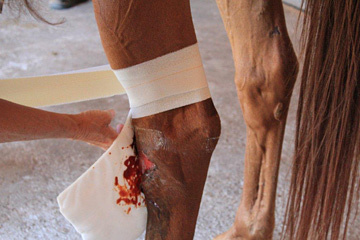 If you have questions and have a dummy or “maladjusted” foal you need to make sure the foal is not sick or has fractured ribs or respiratory compromise. 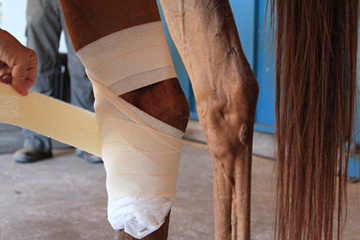 You really should have the foal assessed by your veterinarian. May the squeeze be with you. You walk out and your horse is non-weight bearing lame. He was fine last night. There is no swelling and you have no idea where the pain is coming from. 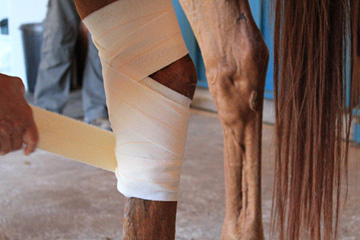 You should feel for a pulse in the fetlock region. Then flex the leg. 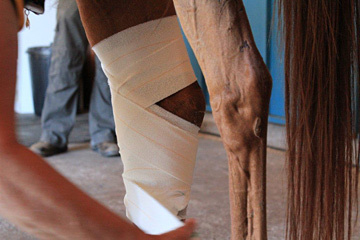 If flexion doesn’t cause the horse to react, and you have a strong pulse then most likely the pain is in the foot. 9 cases out of ten the source of the pain is an infection in the sole. It could be a puncture or it could be an abscess. Look for the source, and look for pain or smelly fluid when palpating the coronary band, and heel bulbs. If there is fluid then resolution may be soon. The longest one I attended took 6 months, and the quickest took a day. The pain is like a blood blister under your fingernail. 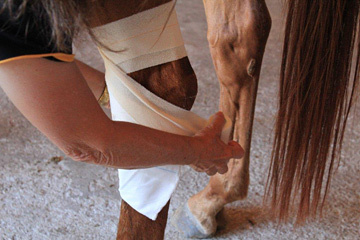 Ouch, but relieve the pressure and the horse is much more comfortable. While there are many ways to treat the abscess, over the years I have stopped doing deep excavations initially. I find the big holes just refill with dirt and then the cycle is often repeated. That is not to say I won’t have a go if needed. 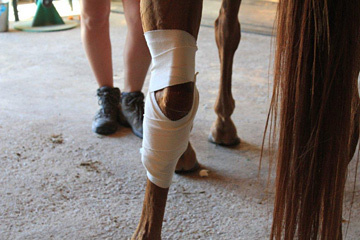 If your horse is amenable, then soaking in Epsom salts and warm water may decrease the time to eruption. I like to poultice, give pain meds such as bute. 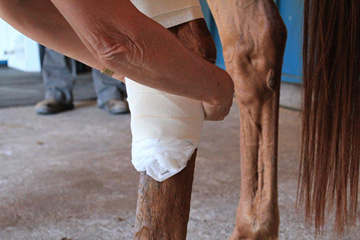 If the leg starts to swell and the abscess has broken, I might give antibiotics. So here is our video on how you can poultice a foot to avoid me when I am at my most expensive…after hours. Please feel free to call us to get initial advice. There are many products on the market, but what we are advising today is readily available and inexpensive. 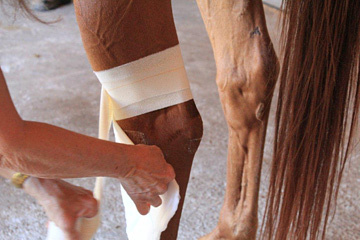 There are as many ways to apply bandages as there are horsemen. 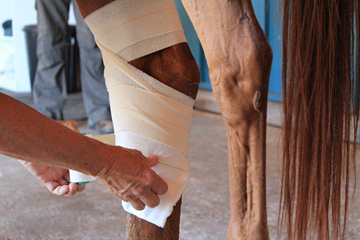 This is a simple and inexpensive way to apply a bandage over an the front of the hock or just below the hock. Many of the wounds are not suturable due to time and other factors. 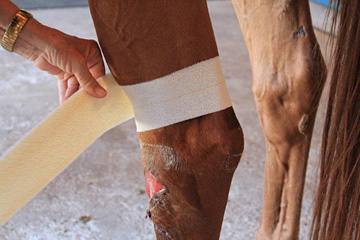 I like to clean the fresh wound with antiseptic solution and scrub. In the early stages I prefer not to apply caustic dressing. 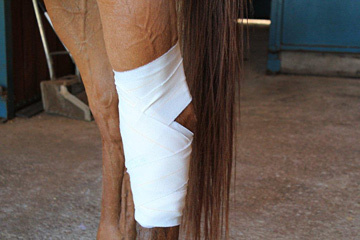 I try to keep the hair around the wound dry so I can apply sticky dressing (elastoplasts or in our practice Askina). I have a piece of combine or other thick dressing that is large enough to cover most, but not the back of the hock. I usually start with sugardine which is betadine solution combined with regular sugar until it is thick in consistency. 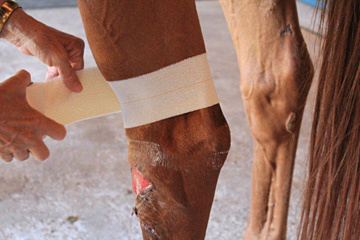 I wrap the elastoplasts around above the hock then after at least two wraps I place the cotton bandage over the wound and catch the top of the bandage with my sticky tape. I then figure eight around the hock above and below the hock without wrapping the point of the hock. This will usually stay on for several days unless your horse is a terrorist. If the horse is lame, excessively swollen or the flesh is protruding then we suggest you call us for advice or an appointment. 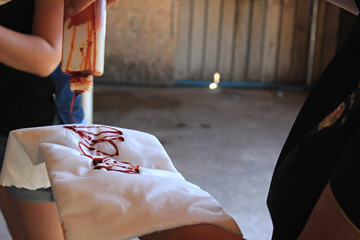 Most wounds are placed on antibiotics initially and don’t forget the tetanus vaccine.